If you want to drive more traffic to your website, you need to take advantage of social sharing. 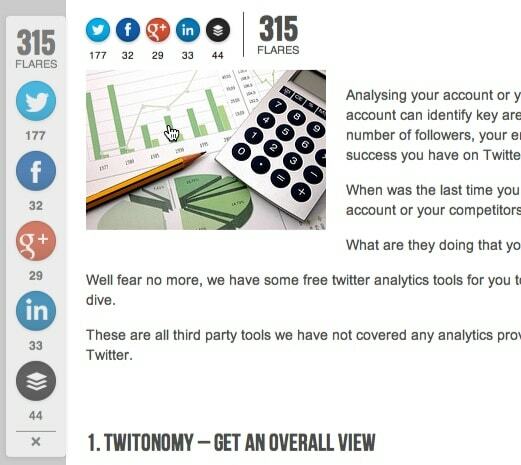 If one of your blog readers shares your post, their hundreds or thousands of Twitter followers or Facebook fans could see it. If those people then click and then share it too, that number is multiplied again and again. So, when a website visitor comes to your blog, are the options for sharing your content on social media immediately obvious? As they scroll through your post, are social sharing icons visible? If not, you could be losing out on a massive number of visitors, sales and conversions. In fact, when a Google error meant that BuzzFeed disappeared from search engine listings, they focused their self-promotion entirely on social shares, and look where it got them!! The quality of your content is important but it’s also equally important that you make it very obvious and easy for people to share it so that it gets maximum exposure. The easier you make it, the more likely people are to share your content with their friends and followers. In this article, we will review three social sharing plugins for WordPress so that you can choose the best one to encourage your readers to share your content far and wide. If you want to listen to the post, just click on the following or read on! Digg Digg is quite a popular social sharing WordPress plugin and lots of bloggers use it. With the Digg Digg plugin, you can display a floating widget to the left of your posts and also display a horizontal widget across the top or bottom of your posts. It supports sharing to the following platforms: Twitter, Buffer, Facebook Share, Facebook Like, Digg, LinkedIn, Google +1, Reddit, dZone, TweetMeme, Topsy, Yahoo Buzz, StumbleUpon, Del.icio.us, Sphinn, Designbump, WebBlend, BlogEngage, Serpd, Pinterest, Pocket and Tumblr. However, Digg Digg hasn’t been updated since 2nd of July 2013. This means that, if it develops any bugs after a WordPress update, or if new social platforms start to emerge, the plugin will not be equipped to deal with them. Even though it seems to still be working well, there’s a high chance that it will start to fail or cause errors at some stage. Although it hasn’t been updated for a long time, there are still a lot of sites using it. This means it’s relatively stable and the people who use it are obviously happy enough with it. The floating widget, which appears as you scroll through the post, is useful as it is always visible to users when they are scrolling. 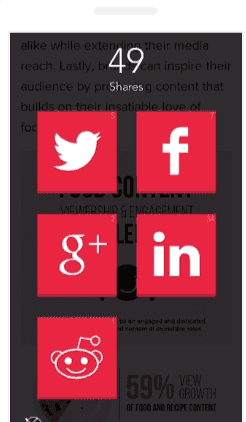 This encourages more sharing because you don’t need your readers to be at the top or bottom of your post to share it with their connections. It has not been updated in years so this product will eventually be taken off the market. It does not have good mobile support. The floating vertical share bar does not work on a mobile device so you are relying on the sharing icons displayed across the top and the bottom of the post. There are better mobile sharing solutions and, because there will soon be more mobile devices in the world than people, it is really important to optimize sites and sharing tools for smartphones and tablets! 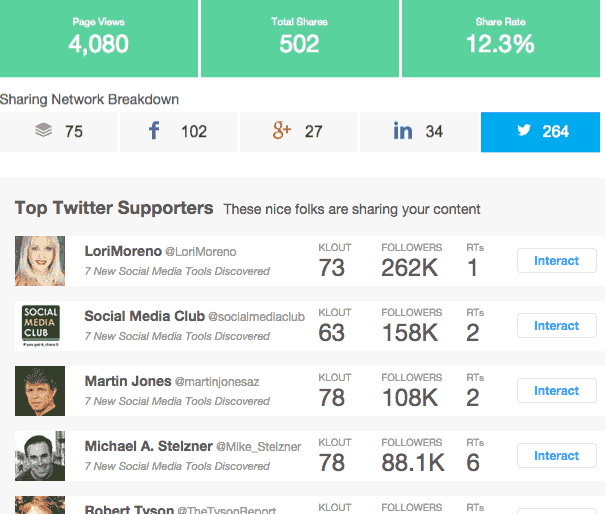 There are no analytics so you don’t know who is sharing your content, the percentage of shares you get, etc. If you want to be able to really analyze what works on your blog and what doesn’t, you need to be able to easily access details of what is being shared, and by who. Flare is another WordPress social sharing plugin and it has a similar vertical share bar to that of Digg Digg, which is displayed alongside a post when you scroll. Flare supports a wide range of platforms and provides a good variety of customizable options so you can choose how the social sharing buttons will look and work on your site. This is great because it means you can make sure the style and design fit your branding. The social sharing buttons will move as you scroll! Flare is not tied exclusively to WordPress so you can install it on non-WordPress sites too. Two especially nice features of Flare are the statistics that are provided and the mobile sharing facility. In terms of the stats, they provide a daily report that shows the number of shares on a blog post, the people who shared the content, where the content has been shared and which posts are the most popular. With this information, you can identify social influencers who have expressed an interest in or promoted your content, and this could prove to be the start of valuable new relationships for your business. When Flare is installed on a website and a visitor accesses that site on their mobile device, if they want to share a post the full screen is taken over with a really nice display. In the bottom left-hand corner of the screen, you can see the total number of shares for each post. Flare provides really good, useful statistics. By studying these, you can understand what works and what doesn’t work and start to develop new relationships with people who could become brand ambassadors. You can easily customize how the Flare sharing icons look on your site. There is good support for smartphones and tablets. The mobile sharing option is nicely designed and it is very easy to share posts on a mobile device with the Flare app. There is a ‘Flare lite’ version that is free but, if you want all the great features it provides, including full mobile optimization, you’ll need to pay for the $89 per year version. AddThis provides a suite of tools and one of them is for social sharing. It provides a good range of options for how the social sharing icons will look and where they appear. You can display them across the top of the post, across the bottom and or at the side as a floating widget, similar to those of Digg Digg and Flare. AddThis provides really good mobile support, which is essential. It has a very large network of people who use the plugins and they track user activity across the sites. Based on this information, they can automatically adjust the sharing icons based on the channels a visitor has shared to on previous visits. Clever! 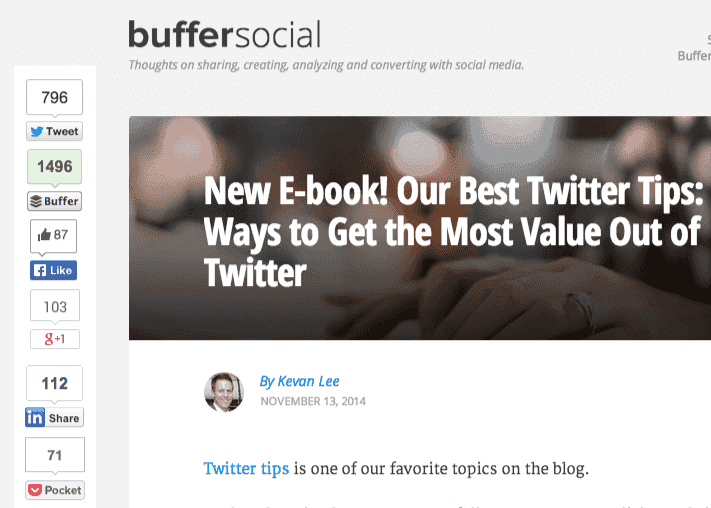 When you buy the social sharing functionality, you also get a good plugin you can use for content recommendations. It supports sharing to 330 different social networks! The Pro version is a paid option. 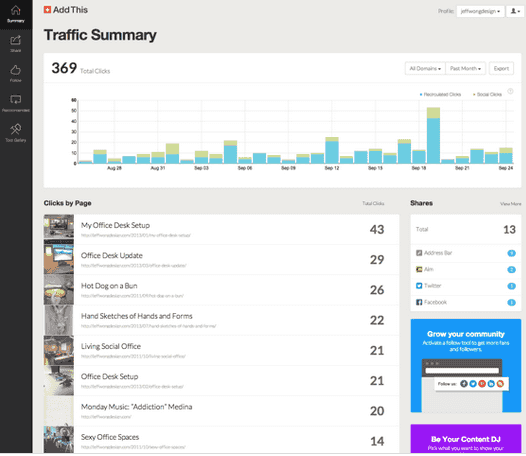 Free users get access to website tools, an analytics dashboard and a weekly analytics email, while Pro users can use nine extra features such as better customization options and priority support, for $99 a year or $12 a month. Although Digg Digg has historically been a really useful social sharing plugin, the fact that it is no longer updated means that we can’t recommend it above the other options we mentioned. Social networks change and, as WordPress themes and online best practices change, using a plugin that is regularly updated is essential. Old plugins that aren’t updated can also sometimes be a security risk because hackers are always trying to find vulnerabilities in scripts – when plugins aren’t updated, they don’t issue patches or fixes when code is exploited. For this reason, we would recommend avoiding Digg Digg and, instead, going with Flare or AddThis. Even though Flare and AddThis offer their best features to their paid users, the price for both services is very reasonable and affordable, so don’t let this put you off. Whether you choose Flare or AddThis will probably come down to the exact functionality you want and the appearance and usability of the sharing icons. Take time to look through their features and prioritize the needs of your site and its visitors. Do you use social sharing plugins? What is your favorite WordPress social media plugin? Do you think you will try a new one, having read this post? Tell us in the comments! We love to hear from you.